My work engages themes of geography, memory, traveling and convergence. The Sheaves (a new series of monotypes) and my tapestries are largely concerned with landscape and language—and how visual forms interact in the mind with place names (latent impressions from history) and with the knowledge/experience of the physical world that is couched in words and held in one’s body. The Pantyhose series considers the figure as a kind of geography, marked and formed by personal experience of social/ cultural formulations. My images are essentially observation-based inventions, as opposed to being abstractions of specific sights. They reflect colorist and spatial ideas associated with painting, and a printmaker’s concern with placement and form. My weavings are generated from a basic matrix of warp threads stretched parallel and equidistant across the frame of a simple loom: and an idea. I never work from a fixed plan, but discover my imagery within the interplay of materials and forms as they build on the warp, searching out the expression of my generative idea in the visual dynamics and physical body of fabric that emerges in my hands. 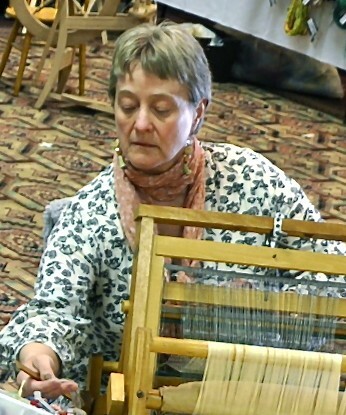 I use various techniques of weaving, especially tapestry weaving, and improvisations, which are sometimes akin to darning, tacketing and appliqué, and sometimes unnamed threadings answering only to themselves. I am traditional in my concern for formal integrity, my technical obsessiveness, and my practice of sound craftsmanship. Invention is discipline for me—it is both my printed score and eccentric flight. photography: Sharon Niederman, Margaret Sunday demonstrating at Taos Fibers Marketplace 2012; art work: John Blake.